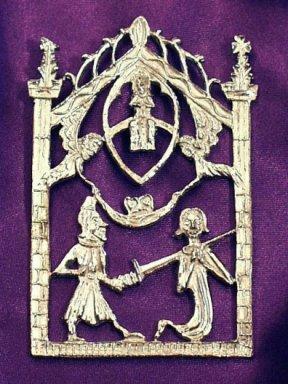 This badge shows the slaying of Thomas of Lancaster. Fifteenth century. Thomas, Earl of Lancaster, was bitterly opposed to Edward II. He was finally defeated and imprisoned in his own castle at Pontefract. This badge shows the execution of Thomas in the lower section. Above this two angels, to the left and right, lift his soul toward Heaven in a cloth. Between the two angels is a gabled canopy within which the figure of Christ sits on a rainbow.